Last friday was the annual Pratt draw-a-thon. An event of drawing various models for a twelve our period, at the Pratt institute in Fort greene, Brooklyn. I make it a point to go every year, determined to stay until the morning. Its not easy, and it certainly tests your creative stamina. I find it a very valueable practice and Pratt always does an excellent job at organizing the event. This year, my goal was to stay primarily for the six hour painting pose. The painting pictured on top is this pose, with two models at opposite angles to eachother. 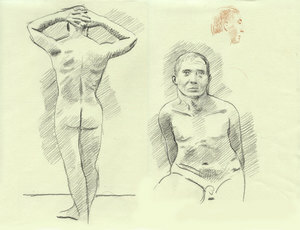 The drawing below are the first drawings I created at the event, and are twenty minute poses. It happens to be the same male model pictured in the painting. At the end of the draw-a-thon, its always wonderful to see the sun rising from the windows of the studio building, and to know that I finished what I started. It gave me a feeling of keeping my word and completing what I set out to do. Aphrodite, the goddess of fertility and love, is my subject at the Metropolitan museum of art as I begin my second time as a copyist. It certainly is wonderful to be in the Roman wing, with its silvery light on ancient statues, that make everything alive and vibrant. This program continues until the middle of December, making this past week my fourth session. I have had some very interesting experiences as I answer many questions from the curious onlookers, who are not used to seeing a painter with an easel in that particular gallery. Some asked me if I was selling my painting to the Met, and others were more interested in my technique and materials. I also belive that so many pictures were taken of me that I must be on a hundred Instagram posts. I look forward to my wednesdays at the museum, as I continue to work on my painting, not knowing what to expect.